User Profile Cannot be Loaded on Windows – How to Fix? There are endless annoying errors can occur during Windows installation, but the most troublesome and irritating defect is a corrupt and non-working user profile. While it is assured that all your precious and important data and documents are safe on the hard disk, the only problem that remains is with the user profile that interrupts from gaining access to the computer. It is indicated by the nasty concerning message that says "The User Profile Service failed the logon" or "User Profile cannot be loaded" and this error can happen in any version of Windows computers including Windows 7, 8, Vista and even in Windows 10. There is no need to worry and having those disrupting feeling as it is very simple to fix this issue. We will show how to fix this problem in all Windows version computers. So, it doesn't matter which version of Windows computer you are using, just skip to the method that is suitable and eligible in your situation. Most importantly, at this point you must realize the importance of backing up data. So, make it a ritual to back up your entire computer regularly to avoid any kind of data loss during these kind of issues. Likewise, you should remove the hard disk from your current computer and connect it to a laptop or different PC and backup all your precious data to take an extra precaution. Method 1: By Creating a New Administrator Account. It is the simplest way to fix this issue, you simply need to create a new account and copy all the old data from the old account to the current one. If you don't have a separate account then follow these steps to create a new account. Step 1. Reboot your computer into safe mode. Step 2. Launch command prompt by clicking on start or by typing "cmd". And press Enter. You should be able to see a message "The command completed successfully". Step 4. Restart your computer normally and login using the new account. Step 5. Open control panel and choose User Account and Family Safety. Step 6. Click on User Account followed by Manage, give a name to the new account and click on "Create Account". Step 7. Copy all the old data to the new account and use the new account as the main administrator account. Easy as that. If you forgot Windows 10 login password, there is no needt o reinstall the system, just try PC unlocker to crack your Windows login password. When user profile won't be loaded on Windows 10/8/7, don't worry, there is still a second way to fix it. Just repaire it by editing the registry entries. This part including playing with the registry edits. Basically, we will edit the files that are controlling the user accounts. To do this method, reboot your computer into Safe Mode and follow the instruction. Step 1. Open Run by pressing Windows Key + R and type REGEDIT and press Enter. Step 2. 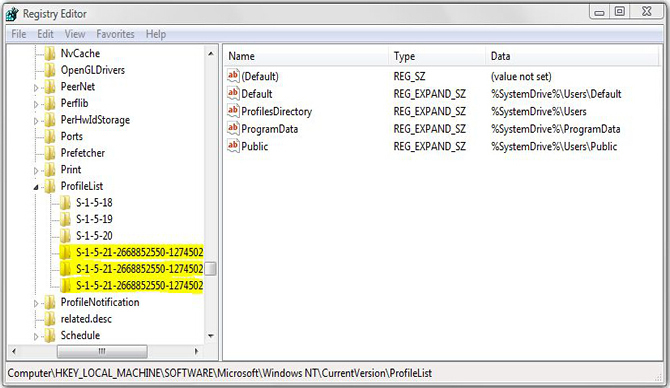 Locate to HKEY_LOCAL_MACHINE/SOFTWARE/Microsoft/Windows NT/CurrentVersion/ProfileList from the left side pane. Step 3. Open the folder that start with $-1-5, check each folder and find the file named "ProfileImagePath" and look for the main user account name that has the issue. Step 4. Choose the folder that has .bak in the name and double-click on it. Simply exit from the Regedit and restart the computer. The profile should be fixed now and you can login normally. If you are using Windows 10 then the procedure is easier than the above mentioned methods. But for this part, you do need a separate working computer with administrator privileges. The steps are slightly different but it should be simple if you follow the instruction properly. Step 1. Turn on a second working computer. Step 2. Go to "C:\Users\Default and copy this folder. Step 3. Reboot the first computer into safe mode and paste the folder in the same exact location. Step 4. Rename the folder to something different to avoid any type of user reinstating. Step 5. Restart the computer and you should be able to login to the main computer perfectly. Additional Tip: You will have to turn on hidden files option from the second PC in order to copy the Default folder. To do so, simply click on View from the folder toolbar and choose "Hidden items". It should make all hidden folder appear on the main screen now. This is how you should fix the corrupted user profile. The problem "user profile cannot be loaded" occurs due to some failure updates on software or due to installation of buggy applications on your computer. But if it occurs with your computer as well then you now know how to fix this issue without any hustle. The first two methods works in all Windows version computers but the third method is only applicable on Windows 10 computers. Enjoy and stay tuned!